This post was originally published in Blunt Moms. Like any normal human being, such compliments used to flatter me. But lately, I have grown quite wary of these unsolicited compliments, that appear more and more insincere and fake. Whatever the person complimenting me might think, I am NOT young. I am, in fact, O-L-D: OLD. I turned 40 last November, and my mind has simply been refusing to register this complex reality. Forty was supposed to be an age for old people, people like my parents, or aunts and uncles! Then I suddenly remember that I AM a Parent, and have been an aunt for over 18 years now. Technically speaking, I’m an “AUNTY’ now. Phew! some realities are simply too harsh to accept! I became a mom fourteen years ago. Well, fifteen, actually, if you take into account the fact that motherhood starts at conception. The nine months of pregnancy are, in fact, the very first months of motherhood. After 15 years of devoting each and every day to my three lovely and equally whiny kids and almost casually throwing away all the little talents I appeared to possess, each time discarding bits of my dreams and aspirations along with them, I recently and very lately discovered a new one. I could write. And so, I began to write. Once upon a time, a million years ago, I was a practising psychologist. So I started writing stuff on Psychology. I had an additional degree in English/American literature, so I tried to infuse my knowledge of Literature in my writings. I was passionate about History and Philosophy, so I wrote about that too. Who can ignore politics these days, I even wrote a few pieces on politics. Scientific Research had always been a favourite pastime, so I wrote a few research articles on science-related subjects as well. And then I actually started getting published. I was and still continue to be thrilled each time a piece gets published, as it serves as an acknowledgement of my one talent – perhaps my only talent! Yet I find that this one talent is forever in danger of elimination. Because sometimes I’m so tired after constant parenting of a 14-year-old, a 10-year-old and a 4-year old that when I finally get my time after putting everyone, including dad, to sleep, my brain feels fuzzy and my mind feels blank. And inspiration, quite like a coy beloved, completely evades me for days upon end. Until I actually start believing that I can write no more. That my ability has burned out. It is all finished. Finis. Kaput. Then there are times when I excitedly hold up a newly published piece to my teen and preteen, and they literally yawn in my face, silently telling me to “get a life!” You’d think they’d appreciate me more. I mean, I don’t mean to brag, but not all moms are published bloggers. In fact, sometimes I’m on the verge of feeling like a Supermom, but only two things hold me back: one, I don’t own a superhero costume, and two, they simply do not view me as supermom. Just boring old mom mooning over her boring new piece that they cant escape hearing about, poor dear souls! Then I get a grip on myself and try to look at things from their perspective. I mean, honestly, what would score my boy more points with his friends: “Dude, my mom’s new article got published,” or “Bro, I just found out the name of Bruce Wayne’s mother’s great grandfather’s paternal uncle’s dog!” Quite obviously, the latter! Mentioning mom’s article is simply not cool. Not when you’re a teenager, at least. Yet, at the end of the day, we, the moms, should stop deriving our self-worth from our kids’ opinions of ourselves and focus on our own opinion and self-esteem. Kids will be kids, and believe it or not, kids will be mean. Do not let that force you out of the competent Supermom zone and bring you crashing back into the boring mom zone. We are all moms in the end. Heck, at the end of the day, even Queen Elizabeth is mum! But should that stop me from proving my own self-worth to myself? No siree! Absolutely not! In the end, it is I who should be satisfied with my own self-image. That is what really counts, and contributes towards making me a better mom. 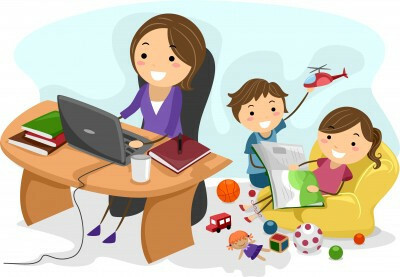 And now – if you’ll excuse me, I’m going to don my Supermom cape, sit in front of my laptop, and write another boring blog to torment my little ones!